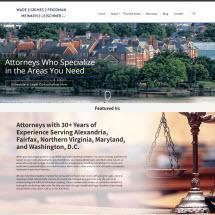 For comprehensive and detailed counsel regarding estate planning in Alexandria, Virginia, people turn to Wade Grimes Friedman Meinken & Leischner PLLC. At our law firm, we assist clients in achieving a diverse array of goals for the future, including individuals whose net worth exceeds $2 million. Because of our outstanding representation and commitment to ethical practice, several of our attorneys have earned the highest rating possible of AV Preeminent* from Martindale-Hubbell. We handle all kinds of estate planning issues at our law firm, including complex and contested cases. Regardless of the specific circumstances involved, our goal is always to maximize asset protection. We accomplish this with the creation of wills, trusts, powers of attorney, and advance medical directives. With a deep knowledge of current tax laws, we help clients avoid unnecessary taxation on hard-earned assets. We also assist clients with the appointment of guardians and conservators, and are at the side of family members during emotional probate and administration proceedings. Estate planning is just one of our key areas of practice. Our attorneys also assist clients who need legal counsel or courtroom representation for a broad range of concerns, including personal injuries, criminal defense, bankruptcy, business law, employment law and real estate law matters. Although we are located in Alexandria, we work with people across Northern Virginia. We invite all prospective clients to meet with us at our law firm to discuss their cases. At Wade Grimes Friedman Meinken & Leischner PLLC, we are pleased to take credit cards as an accepted form of payment. They have a all High Excellent Rating from other Clients.